04 12 2012 - BARCELONA – Spain’s three major operators, Telefónica, Vodafone Spain and Orange Spain, are finally ready to sign a memo of understanding to work together on a common platform for introducing NFC services, the chief of Telefónica’s regional division in Barcelona told NFC Times. Kim Faura, director general for the Catalunya region for Spain’s largest operator, said the telcos plan to develop technical standards for the NFC platform, including mobile wallets, which they plan to launch as early as this year. And according to the head of CaixaBank, Spain’s most active bank in pursuing contactless payment, online payment company PayPal is interested in the budding NFC platform. Faura, along with the managing director of CaixaBank, Antonio Massanell, and the mayor of Barcelona, Xavier Trias, were speakers at a press conference today at the Mobile World Congress announcing the launch of contactless and planned rollout of NFC in Barcelona, that latter possible before the end of 2012. The telco group would not apparently be a joint venture, but instead just coordinate development of the NFC platform, using SIM cards the operators issue as the de facto secure element in the phones. The telcos plan to rent space on the SIMs to banks and other service providers, Faura said. “We are going to start in Barcelona; it’s the mobile world capital,” he told NFC Times. The telcos hope to sell a few million NFC phones in the city over the next three or three and a half years. Barcelona plays host to the giant annual mobile industry trade fair. Like telco working groups and joint ventures forming in other countries, the Spanish NFC consortium says it would be open to membership from other mobile operators and service providers. The telcos first disclosed plans for the group last March. Telefónica in Spain, the flagship of Telefónica Group, has held at least two NFC trials with CaixaBank, part of La Caixa Group, and one of Spain's largest banks. That includes a large mobile-payment pilot involving 1,500 customers in the resort city of Sitges, outside of Barcelona. In addition, the bank is spending up to €40 million (US$53.8 million) rolling out contactless cards, point-of-sale terminals and ATMs over the next three years in Spain, starting with the Balearic Islands and Barcelona. CaixaBank’s Massanell told NFC Times that the NFC services will not only include payment, but couponing and such city card services as fare payment for public transport and parking, as well as library ID. Moreover, he said payment won’t only include such applications as Visa payWave, which the bank has used in at least two NFC trials. CaixaBank is also a major merchant acquirer in Spain, with 130,000 point-of-sale terminals deployed. And the bank has been in talks with PayPal to support PayPal’s planned mobile-payment service at the physical point of sale on CaixaBank terminals. But unlike plans by PayPal to begin its bold expansion from the online to offline worlds in such countries as the United States by having consumers tap their phone numbers and PIN codes into POS terminal keypads and then doing cloud-based payment, Massanell said PayPal and CaixaBank are talking about using NFC technology. The transaction itself would still be conducted in the cloud, on PayPal’s authorization servers. But Spanish consumers would tap their NFC phones to transmit the phone numbers to the terminals. The account details and phone number would be contained in an application in an NFC wallet, Massanell said. Contrary to press reports, PayPal has not rejected NFC technology–even in the U.S.–for its planned move to the physical point of sale. But it doesn’t want to wait for a high penetration of POS terminals supporting NFC to get rolled out. By some estimates, contactless terminals account for fewer than 3% of total POS terminals in the U.S. PayPal is also planning to issue conventional cards to its account holders wanting to pay in physical stores. That relatively scarcity of contactless POS terminals might not be such a problem in Spain after two or three years. Despite the country’s poor economy, La Caixa appears determined to go ahead with its plan to convert all of its POS terminals to contactless, along with undertaking the first rollout of contactless ATMs worldwide and issuing more than 10 million dual-interface payment cards. Other banks also have contactless programs. For example, BBVA and Bankia, last month reportedly said they would start to roll out contactless technology supporting Visa payWave in Spain’s capital city, Madrid. Also, Banco Santander and Orange Spain last week said they planned to hold an NFC trial in Madrid, supporting both payWave and MasterCard PayPass. CaixaBank already has equipped more than half of its 15,000 POS terminals in Barcelona for contactless. But the NFC commercial launch in the city might not happen before the end of this year. And it could take three years or more for a full national rollout to take place, said Telefónica’s Faura. While handset makers are introducing more and more NFC models, it will take a while for NFC devices to get distributed widely, he said. 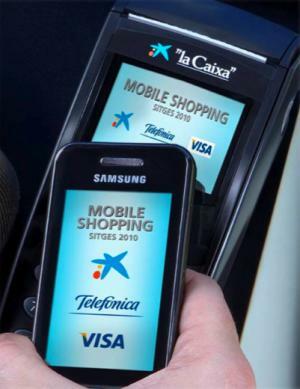 At today’s press conference, organizers only had the 2G Samsung NFC phones Telefónica and La Caixa used in the 2010 trial in Sitges on display. (See photo above). “The bottleneck will be terminals, not the technology,” Faura said.